is a music, film and TV fan weblog. All reviews are strictly my own opinions. Occasionally I like to try something I've never heard of, and just stumble onto from some unexpected source. 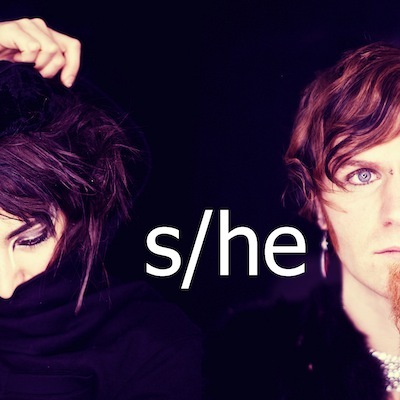 So it was that while looking at Flexstyle's BandCamp page I noticed a recommendation for s/he, a US-based duo whose album he described as "Some of the best electronic pop music you've ever heard in your life." Well, he knows his stuff, I thought to myself, so I gave in and listened to their self-titled (and only) album. Turns out that was a good decision, because while that may be high praise to live up to, this is indeed a class act of an album which in a less cynical and fad-obsessed world would deserve a major-label release. To begin I'll have to explain "electronic pop". It's a shame that the label pop often has a pejorative sense to it, thanks largely to mass-market commercial acts that pander to every passing trend and have no discernible personality of their own. This is not that kind of pop. Neither is it quite synthpop in the old school 80s sense of the term, as although s/he has a lot of synths on it and the production is clearly quite modern, it doesn't fetishise the obviously artificial tones of the old analogue synths in the way acts like Depeche Mode or Gary Numan did to the extent of using them exclusively. s/he is a band equally at home using synths, guitars, or combinations of both and using whichever instrumentation necessary to back up well-written and catchy songs. This is why calling them a pop band - acknowledging that their sound is defined by the songs and vocals and not limited by the instrumentation they employ - is extremely appropriate. While opening track "One to Glow" immediately shows that s/he can do a good upbeat synthpop number, complete with bouncy triplet rhythm for the sawtooth bass, the breadth of their sound gets confirmed straight after by the pop/rock "Here With You" which is anchored by live drums and electric bass. Once these two songs have passed, the band largely alternates between predominantly electronic and more pop-rock song, with some tracks which blend both pretty well. Fortunately none of the songs feels like it's stuck in a pigeonhole or too familiar. Sonically the texture of these tracks isn't pushing any boundaries but thankfully the arrangement and songwriting is original enough that you're not stuck hearing throwbacks or poor imitations of older bands either. Of particular importance is the singing, which is part of every song on this album. s/he has a great singer in Michelle Chamuel, who sounds a little like Kate Bush in the more restrained moments and stretches to a more biting delivery in the rockier numbers, backed up by very good usage of reverb, big roomy delay or distortion. Having some power and bite behind the vocals tempered by a little range and softness tends to win me over, as big chunks of my musical diet are either dance music in which much softer vocals dominate or more mainstream pop where the production strangles the energy out of vocalists for the sake of loudness. Chamuel is a singer unlike most I get to hear, and I love the way she makes these songs sound. "Mr Hyde" is one of her top performances here, which is where the Kate Bush comparison came to mind from the chorus. Here her voice sits so well with a ridiculously catchy dance-pop groove and piano I find myself wishing that mainstream pop could be more like this. Another more agressive number that showcases the groups more electronic side as well as Chamuel's power is "Good to Get Away", which is pretty much everything I could want a synthpop/drumstep crossover to be - heavy drums, insistent and swaggering low-tempo rhythm and a big powerful bassline (that thankfully isn't a massive treble-heavy screech) matched up with a really strong vocal performance and melodic lead synths. The most aggressive vocals surface on "Love War", the punky but still fairly electronic up-tempo track. The mixture of Chamuel, bandmate Tyler Duncan and a great group of session musicians who contribute excellent guitar, drums and other instruments to this album has resulted in ten songs that are consistently fresh and exciting, with no duff tracks amongst them. Yet this is an indie self-release that I had to find on BandCamp! If you like female-led pop bands of any sort you should give this a try, and if you're partial to the blending of pop-rock and electronic dance music as well I very strongly recommend it. Get this band some support! The standout tracks are: One to Glow, Mr Hyde, Love War and Good to Get Away.